The FreeX radio controlled drone is a versatile, very affordable and totally beginner friendly Quadcopter, specially designed to do aerial filming with GoPro cameras. With its brand new design and state of the art, brand new flight controller FreeX offers an unmatched yet extremely safe and reliable flight performance. The newest SPA built in safety protocol algorithms of the FreeX flight controller will always make sure that the drone will never show any out of control drift or fly away behavior, even if the GPS, magnetometer or compass are damaged. This version includes a strong and stylish aluminium carry case. It keeps your model safe during transport and if giving the FreeX as a gift makes it that bit more special. FreeX is a total RTF (ready to fly) right out of box model. No need for any complex pre-flight settings, no programming and parameter tweaking is needed. Its It's ready to fly right out of the box after a simple compass calibration and one touch gyro initialisation with the supplied USB dongle. With the optional GoPro high performance light weight gimbal, you are ready to shoot stunning aerial videos using your Free X quadcopter in no time at all. Just unbox your quadcopter, install the gimbal (if also purchased) with the few screws, install the battery and power it up. The do the easy one touch gyro initialization and a simple compass calibration, attach the propellers and you are ready to shoot stunning aerial videos! The very easy to setup dual rates on your Free X radio system will provide you with a quick control sensitivity change even on the field. Reduce the dual rates to make your quadcopter docile and increase them to 100% if you want a total agile and fast quadcopter to suit your flying style. The Free X drone is going to be your next best friend for all purposes, no matter if you are learning to fly quadcopters, shooting amazing aerial films with your GoPro or flying FPV with up to 1km range. The Free X has some pretty impressive features. 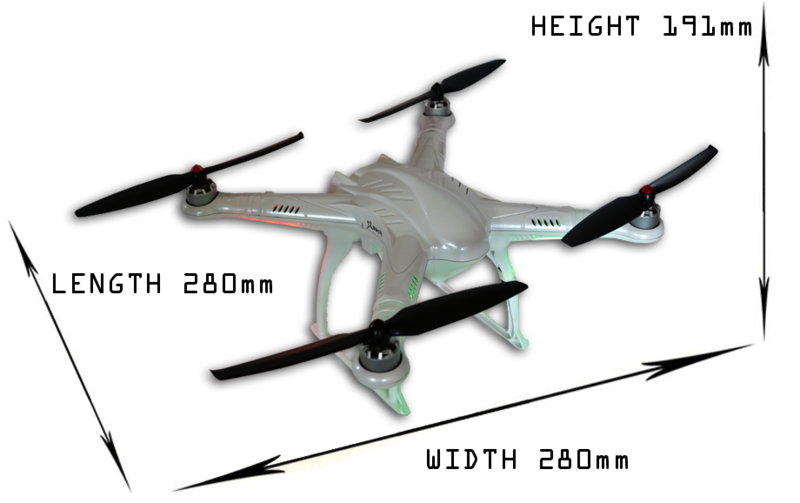 1.The Attitude and Altitude Hold mode: Quadcopter will hold its altitude and attitude once all the sticks are centered. 2. The GPS Position hold mode: Quadcopter will hold its altitude, attitude and GPS position once all the sticks are centered. It’s the perfect feature for beginners to learn to fly as this gives them plenty of time to build their orientation and flying confidence. 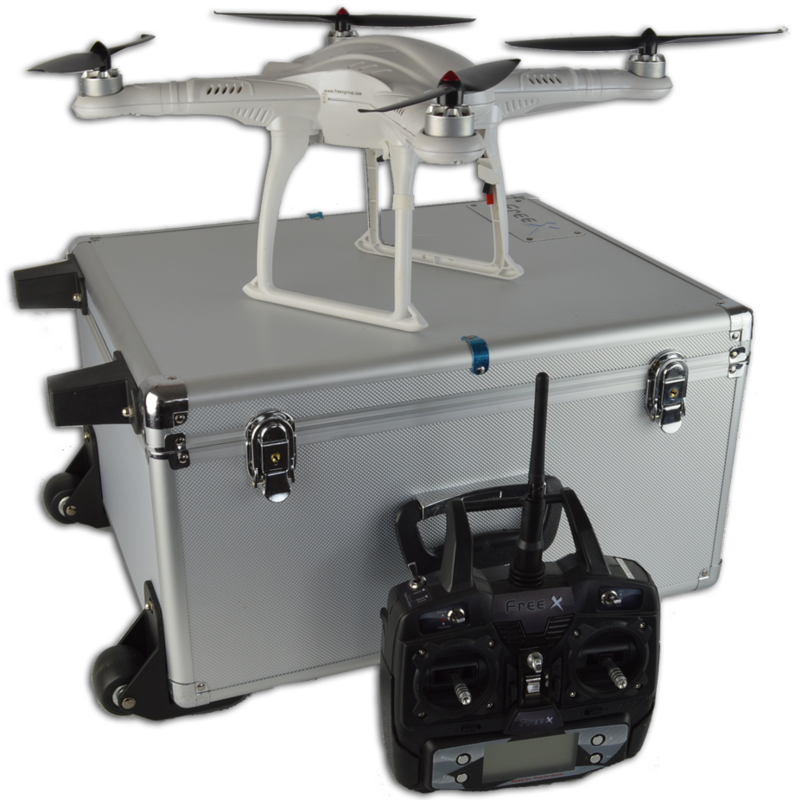 Free X quadcopter with the Free X flight controller offers very precise and reliable Auto Return to home both on Demand and on failsafe. A) Hover at last known position: Once the control signals from Radio control are lost, the quadcopter will hold its last know position and will hover at the same altitude and GPS position. It will not return to home. This is the best feature to use if you are flying in an area with tall trees or flying inside a city where if the failsafe RTH activates and your quadcopter flies back to home, there is a possibility it will crash into any building or tree in its way back home. 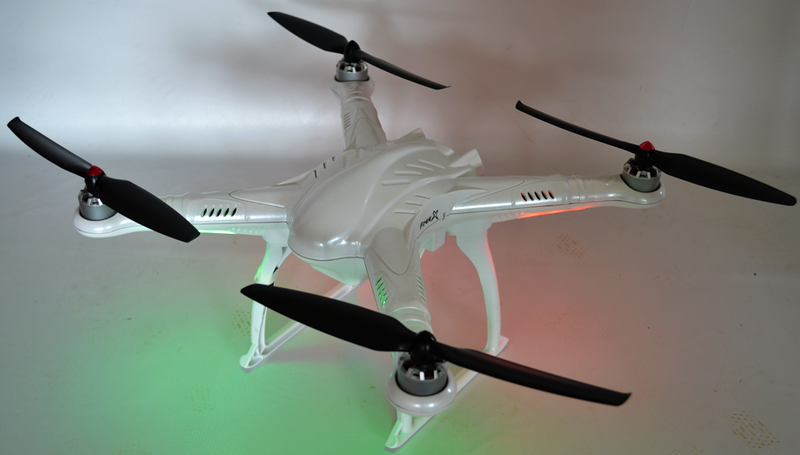 Users can then walk or drive closer to get the quadcopter back in control range and start flying again. B) Auto return to home and land: If this mode is selected using radio failsafe switch before flight, once the control signal islost, the quadcopter will fly back to home (take off position) and land. During this time, as soon as the quadcopter comes back to range, the user can gain full control and descend quickly, ascend again if there is something on the landing zone or control the quad to avoid trees etc on the way back to home (once control signals are established). C) Auto return to home and land on demand: Feeling tired and don't want to fly back home? No problems. Users can select Return to home and activate RTH failsafe with a simple flip of a switch and your quadcopter will fly back to home and land. During this time, users will have full control to descend quickly, ascend again if there is something on the landing zone, and or control the quad to avoid trees etc on the way back to home. Once users leave the sticks to center the quadcopter will resume its return to home and landing. When the voltage is lower than the set voltage in the Free X parameter control software, the LEDs on the quadcopter will blink to inform the pilots of low voltage on battery and pilots can easily fly back and land the quadcopter before battery totally runs out of power. FreeX has a special SPA (Safety Protocol Algorithm) for electronics, that can prevent GPS glitches once or if the magnetometer is damaged or not working properly. This prevents abnormal flight behavior, out of control drift or fly away. There are some high intensity LED indicators which are used to help you to see the orientation during flight. The fuselage structure is stronger than other brands and 70% resistant to crash and impact damage. Optional lightweight, two-axis brushless gimbal for GoPro cameras. Easy to install, plug and play. No complex setup or tweaking parameters for Gimbal. Just install the GoPro, and power it up to use. 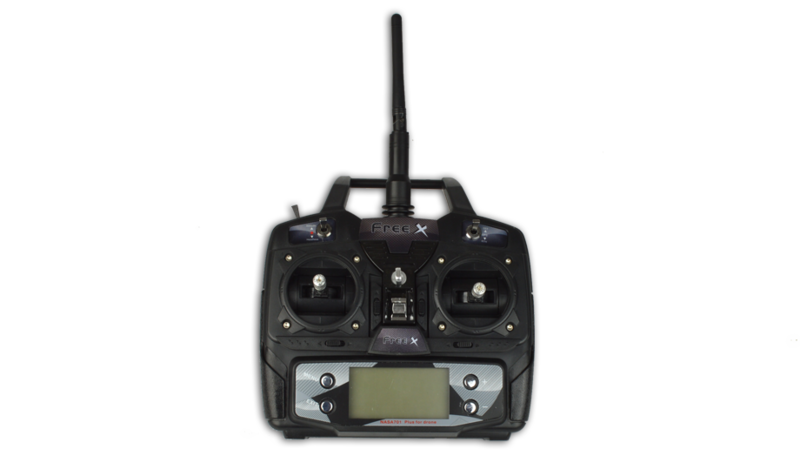 The transmitter is an all-in-one design specially made for the Free X and is pre-programmed for your convenience. User can calibrate as per their preferred flying style and experience. The new software version adds the neutral point calibration, accelerometer-gyro, barometer, magnetometer calibration mode (it’s also the calibration mode of pushing up the throttle and CH4 to the left). 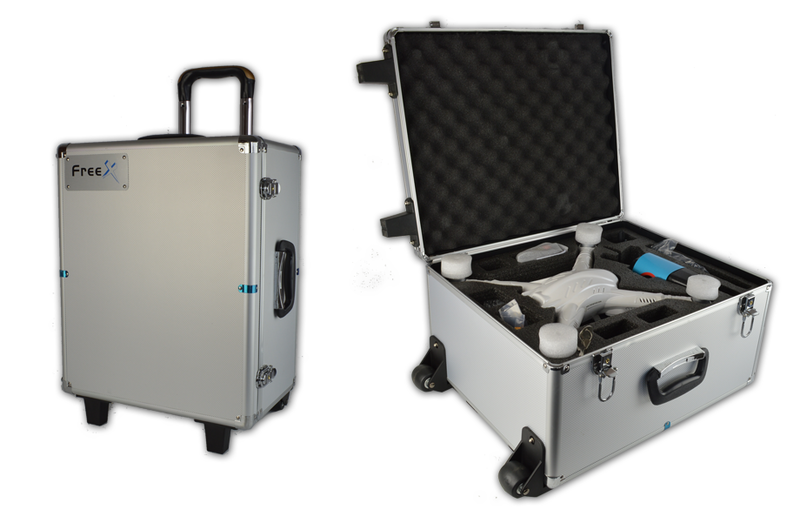 Stylish aluminium carry case included for safe and easy transport. Ready to fly right out of the box after a simple compass calibration. Pilots can choose from two modes upon lost control signal - return to home or hover at last position. Does it come with gimbal, 1 battery, or are other things required? The new software update allows for you to create boundries, so that is can only go so far before it will not fly any further. This Quadcopter (Drone) is an easy to fly model providing you read and understand the operating manual and apply all the procedures in the pre flight checks prior to take off. It is one of the toughest drones out there and can take a few knocks, all parts are replaceable allowing the beginner to get to grips with modifying or repairing with relative ease. I gave 5 stars for fun factor but this model deserves 10.